South Africa coach Heyneke Meyer has made three changes to the side that beat England last weekend for the third and final Test in Port Elizabeth on Saturday. With the Springboks 2-0 up in the three-Test series, Meyer has opted to give flanker Jaques Potgieter his first Test cap. He comes in for Willem Alberts, who picked up a knock at Ellis Park last time out, with Gio Aplon starting at fullback in place of Pat Lambie, who has an ankle problem. 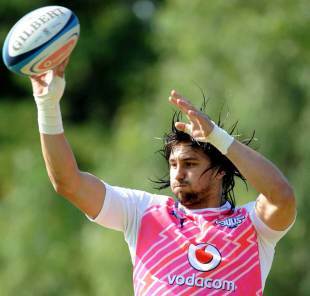 The other change sees Wynand Olivier start at inside-centre, with Francois Steyn due to be married at the weekend. "Injuries have forced us to make a number of changes, which is never ideal, but this provides an opportunity for players like Gio, Wynand and Jacques to put up their hands," Meyer said. "Gio is our third fullback of the series, but he's experienced and has been part of our planning. "Wynand came on as a replacement in both of the first two Tests and knows our game plan, while Jacques has impressed this year as a very strong ball-carrier. Hopefully he can continue with the good work Willem has done in the last fortnight." The team will be led by Jean de Villiers, with Meyer confirming that the centre will lead his side for the rest of 2012. "Jean had established himself as a brilliant leader and ambassador for the Springboks and South African rugby in the last two weeks," Meyer said. "He leads the team with distinction on and off the field and gained respect, not just from his team mates and the management team, but also from the media, public, sponsors and other stake holders. "We have built up an awesome working relationship based on trust, integrity and loyalty, which is why I decided to make him the captain for the rest of the year."